Single-game tickets are available right now. You already know I’m a big fan of buying the season tickets and avoiding the fees and increased price. But, if you must purchase game-at-a-time, or just want to supplement your own season tickets with additional for friends and family, follow this link and buy away! 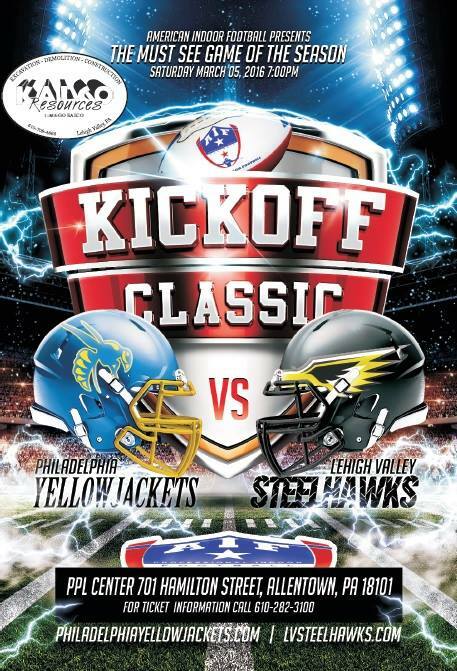 Advanced Fan Information: The preferred section for “Noise Nation” at the PPL Center–for SteelHawks Football–is 116. It’s in the club area, but the price is the same! And, it’s near the bar! Sweet, right? 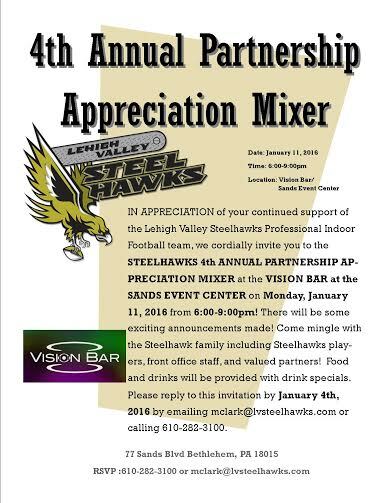 Season Ticket Holder and Partner Mixer: Season ticket holders and advertising partners of the team will be gathering at Visions at the Sands on Monday at 6PM for some announcements and other goodies. We’ll have more information about the team and the 2016 campaign following the event.